GoCD is a continuous delivery tool specialising in advanced workflow modeling and dependency management. It lets you track a change from commit to deploy at a glance, providing superior visibility into your workflow. It’s open source, free to use and download. I’m starting today a new tutorial series about the Django fundamentals. 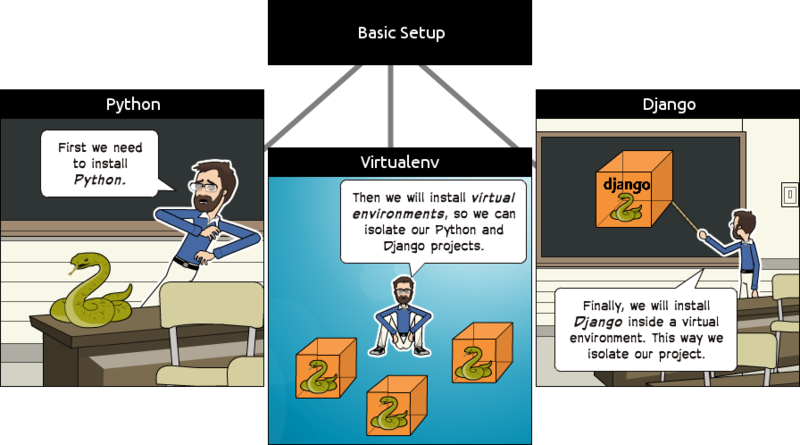 It’s a complete beginner’s guide to start learning Django. The material is divided into seven parts. We’re going to explore all the basic concepts in great detail, from installation, preparation of the development environment, models, views, templates, URLs to more advanced topics such as migrations, testing, and deployment. Hatch is a productivity tool designed to make your workflow easier and more efficient, while also reducing the number of other tools you need to know. It aims to make the 90% use cases as pleasant as possible. Provide platform-independent abstractions for I/O multiplexing based on the select module. Run reddit on your local machine with PyCharm to help you through the way. This is part 2 of a series of tutorials, in which we develop the mathematical and algorithmic underpinnings of deep neural networks from scratch and implement our own neural network library in Python, mimicing the TensorFlow API. I made 1000 HTTP requests using Goroutines and Python’s Coroutines. Do check out Go Programming Language Newsletter http://importgolang.com to keep track of Go ecosystem. Beginner’s guide to parallel programming. In this post I want to explore some of the key similarities and differences between two popular deep learning frameworks: PyTorch and TensorFlow. Why those two and not the others? There are many deep learning frameworks and many of them are viable tools, I chose those two just because I was interested in comparing them specifically. I was introduce to Luigi by my friend Shanmuganandh. It has since become an important tool in my Python toolkit. Do check it out. Deficiencies in the startup time for Python, along with the collections.namedtuple() data structure being identified as part of the problem, led Guido van Rossum to decree that named tuples should be optimized. That immediately set off a mini-storm of thoughts about the data structure and how it might be redesigned in the original python-dev thread, but Van Rossum directed participants over to python-ideas, where a number of alternatives were discussed. They ranged from straightforward tweaks to address the most pressing performance problems to elevating named tuples to be a new top-level data structure—joining regular tuples, lists, sets, dictionaries, and so on. With the aim of making Bitcoin products development easier and more effective, at Chainside we decided to develop btcpy, a new Python 3 SegWit-compliant library, which is focused on providing a simple interface to parse and create complex Bitcoin scripts. Python, being awesome by design high-level and interpreter-based programming language, provides us with many features for the programmer's comfort. But sometimes, the outcomes of a Python snippet may not seem obvious to a regular user at first sight. Here is a fun project attempting to collect such classic and tricky examples of unexpected behaviors in Python and discuss what exactly is happening under the hood! Monkey-patching software is generally frowned upon, but there is a time and a place for everything, even monkey-patching. aws lambda A no-headache guide to serve 1x1 pixels in a serverless, Pythonic world. The Zen of Python?—?is a list of 19 general truths for Python design principles. Apparently there is a 20th, but I’m focusing on understanding the written list before speculating on what the Easter Egg could be. Written below is a brief analysis of each rule, taken in large part from an article I read on Quora.com. Below the list is the link for that. This is a daily series called Python Gems. Each short posts covers a detail, feature or application of the python language that you can use to increase your codes readability while decreasing its length. Better, prettier commandline logging for Python--with colors! distributed task queue for asyncio. A faster alternative to namedtuple. D-Bus Binding? for Python that supports coroutines (asyncio). 170908 Zoom.Quiet 用时 7 分钟完成格式化.